The St. Mary’s University School of Law hosted a cadre of international professionals Wednesday for a discussion about accountability in government and implementing ethical practices. The group visited San Antonio through the International Visitor Leadership Program (IVLP), the U.S. Department of State’s premier professional exchange program. 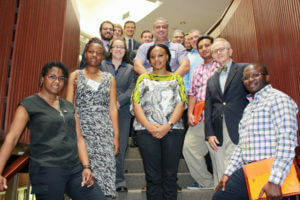 Each hailing from a different country, from the Republic of Cameroon to the Dominican Republic, the group met with Dean Stephen M. Sheppard, J.S.D., ethics expert and Professor of Law Vincent R. Johnson, and a group of student leaders from the St. Mary’s Law Journal and the St. Mary’s Journal on Legal Malpractice & Ethics. The discussion ran the gamut from learning about the local ethics code, to gaining a better understanding of the laws regulating anonymous whistleblowing, to how to handle a government official who refuses to pay a fine related to an ethics offense. “We do take this not only as something important, but something in the heart of the school,” he said.